How the developers created the game, and what's in store for players this December. At the beginning of November we reviewed Activision's latest mobile entry for the Skylanders universe, Skylanders Lost Islands, awarding the game a very well-deserved 4.5 out of 5 stars in the process. We've since spoken to Karthik Bala of developer Vicarious Visions about how the game was designed, and what players can look forward to in future updates. The Skylanders franchise has taken a few very different turns on the App Store. What was the motivation for creating an "empire building" game in the series? Taking a step back, mobile and iOS offered us the opportunity to explore the Skylanders IP beyond what is already available on the console. We've developed three games that each offer a completely different user experience and can be enjoyed by the entire family. Using "empire building" as a basis for the Lost Islands game is a great starting point, as it allows us to look at further developments down the line as we expand the game. We don't see it as purely an empire building game but character building too. We're planning a lot of updates that will change the way you play and having this flexibility means we can mix it up, and surprise players with something they won't be expecting. What lessons did you take from other games in the genre? Which titles influenced your design decisions? There are lots of games that have influenced us. The key lessons we have taken from our favorite games are ensuring that new content is continuously released. This is something we're looking to replicate for Lost Islands by bringing in new rare items and help players grow their collection. We see the game more as a service than a product, so we'll be continuously looking for ways to update and improve it to keep our users engaged. We're also extremely conscious of listening to players via forums and reviews. We want the players to guide the evolution of the game, which I think is essential when looking at maintaining a game's success. It's about building a strong community of players and listening to them. What's next for the game? Can we expect to see any content updates for Skylanders Lost Islands, or will there simply be a new Skylanders game in due course? We're constantly looking at ways to keep players engaged and the next big update introduces social features via ACTIVATE so you can play with your friends. We're also working on a big new feature that will come after social, which will change the way you play the game. We also have nice little surprises coming every week in December so keep your eyes peeled. We know there are a lot of grown-up Skylanders fans out there! How did you go about striking the balance between creating a game that's simple enough for kids to be absorbed in, while still presenting a deep experience for older gamers? Many of the team who created Lost Islands are parents themselves, which helps us understand how to create games suitable for both parents and children. We play Skylanders with our kids so that tends to be deeply insightful. For instance, I have a four year old daughter and play DragonVale with her. As well as being a fun way to interact with my child, I use this time to better understand what makes an innovative, creative game play experience for different age groups. We also do rigorous testing by bringing children and parents into the Vicarious Visions studio to play the game. When we released Lost Islands, we actually staggered its release globally and made it downloadable earlier in some countries. This gave us the chance to test the game on a broader basis and meant we had time to make any last minute changes and balance the game based on feedback from players. What are the team's thoughts on the latest round of Apple hardware? How much of a challenge does it represent and what do you feel the impact will be on the mobile markets? We're all seeing a generation leap in hardware capabilities every year on mobile. It's great in that it pushes us to innovate and drive higher quality on new devices. But it is also challenging to deliver a consistent user experience across all devices. There is a massive difference between an iPad 1 and 4th Gen Retina iPad, and that's only a two and a half year separation between the launches! So we look to the community to help guide us and see what devices people are playing on and make decisions on what to support how to best take advantage of new devices features. 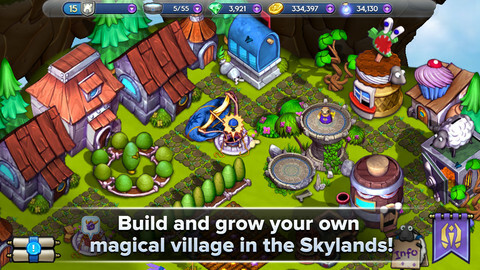 Free-to-play games like Skylanders Lost Island typically do well on the Android marketplace. Are there any plans to release the game on this or any other platforms? What challenges do the different platforms present? Other platforms are certainly something we're looking at and in fact, we launched Skylanders Cloud Patrol on Kindle Fire in September. We're definitely hearing the Android fans asking for Skylanders, but honestly the biggest challenge for the team is bandwidth. We work tirelessly to develop these brilliant games and when they're finished, the next challenge is creating new content to keep players engaged and interested. Our priority has been getting quality games such as Cloud Patrol, Lost Islands and Battlegrounds out this year. Now that we have a foundation to work off, we're planning for next year. 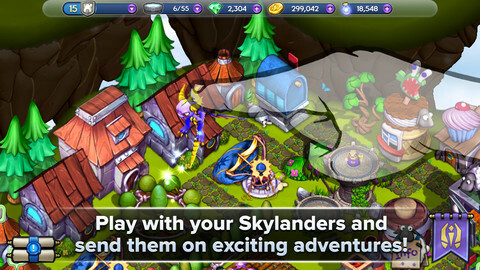 I'm hopeful we can expand Skylanders to a broader base of mobile devices in the future. Finally, do the team have any hints or tips for building a better island that they'd like to share with Modojo readers? Here are some tips from the dev team. Enjoy! - Element of the Day: Pay attention to the element of the day. 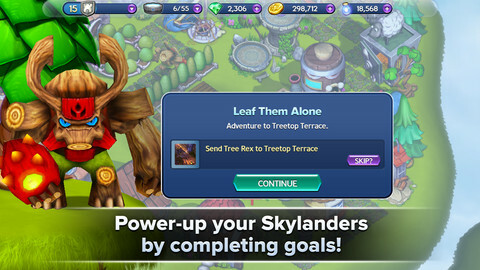 Use it to your advantage by planting Crops and Sending matching Skylanders on Adventures to earn bonus rewards. 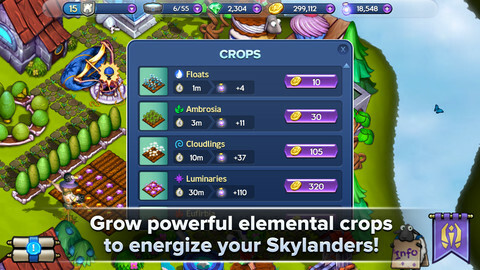 - Using the Elemental Sanctuaries on each island is one of the best ways in the game to earn both Skylander XP and Gold. - Get the Sheep Shearing Hut and the Troll Prison for bonus rewards when clearing the Sheep Mobs and Troll Camps. - Keep an eye out for the goals that give you Gems as a reward. - Always check the Info Panel (by tapping on the sheep character at the bottom of the screen) for great deals and other important game information.